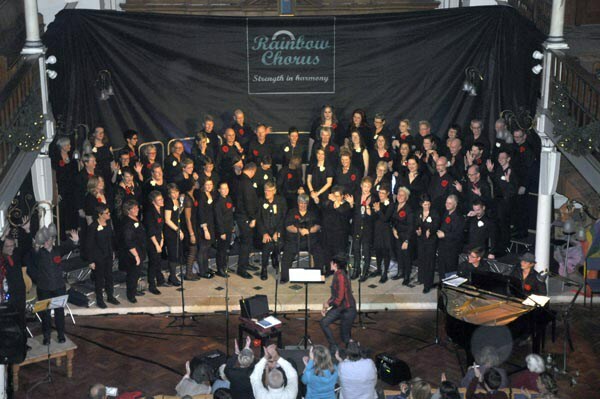 The sold out show brought the Rainbow’s 18th birthday celebrations to a triumphant climax in a year when the choir has achieved a new level of vocal excellence and reinforced its reputation as a first class LGBT community institution. Uniquely, the Rainbows are a non auditioning chorus and Brighton’s only LGBT choir. It numbers 65 singers and while general membership is presently closed, there is always room for new tenors and basses. Do you hear the Rainbows Sing? was a show of two halves with a relaxed chorus, singing and enjoying traditional Christmas songs and carols in the first half followed by a medley from Les Miserables in the second half. Bob Chilcott’s brilliant arrangement of Jingle Bells set the tone for the first half which climaxed with his technically challenging arrangement of The Twelve Days of Christmas, (5 gold rings and all). The audience lapped it up as the chorus teased out and milked all the moments of pastiche during ‘5 gold rings’ and gave a very convincing and entertaining performance of this Christmas classic which employed not one but two BSL interpreters, (Marco Nardi and Fran Coates), for good measures. Other numbers including O Holy Night, Mary’s Boy Child, and Fairytale of New York gave the chorus the chance to open up and show off the huge choral sound they can now produce. I sat on the second balcony where the quality and beauty of the collective ensemble sound was at times simply stunning as it rose to the church rafters. Audience participation numbers including; In the bleak midwinter, Have yourself a merry little Christmas and Santa Claus is coming to town, were sung in tune (most of the time Aneesa) and really added to the enjoyment of the evening. I felt for the first time this year that Christmas had really arrived. The Chorus changed costumes and approach for the second half, a medley from Les Miserables which featured many singers from the chorus in solo roles. All the soloists were up to the challenge giving sterling performances. In future it would have been nice to have their names credited in the program. Highlights included passionate performances of Bring Him Home, One Day More, I Dreamed a Dream and an entertaining rendition of Master of the House that captured all the drunken fun the number demands. Do you hear the people sing? brought the medley to an end and the audience to its feet with a massive roar of approval. The musical team behind the Rainbow Chorus is Aneesa Chaudhry and Mojca Monte who collectively bring a range of skills to the table. Aneesa’s infectious drive and musical direction is responsible for the huge vocal improvement this chorus has made in the last two years and keeps them all focused, while Mojca’s accompanying was at times, especially during the Les Mis medley, masterful. The pair collectively provide a solid foundation for the chorus to continue developing in future years. Special mention for the sound man Matt Burke. St George’s Church is not an easy space to mic and apart from a few tiny problems with feedback the job was very well done. Behind the chorus are a team of volunteers who bake the cakes, serve the drinks and provide front of house. The success of last nights show and all events during their 18th birthday year is as much theirs as the singers. A real team effort. The next Rainbow Chorus show Sing Out! is on May 23, 2016 at St Georges Church as part of the Brighton Fringe.